I've been using Strata software for years. I've tried a lot of others, but for a combination of ease of use and quality of results, it's hard to beat. It's easy to use straight away, but has enough depth and complexity to allow it to do really complex things. 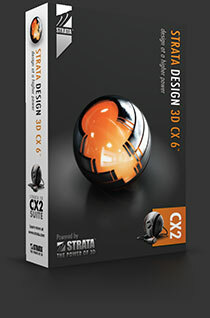 Almost all the images and animations on this site are done with Strata Design 3D CX 6.0. If you want to try it out, there's a free trial version, or the cheaper SE version. I've been trying to get to grips with this properly for years! Fearsomely complicated with an almost vertical learning curve, it's almost infinitely adjustable, and has more levels of control over just about everything than you ever thought possible. Perhaps I'm just used to using Strata, but at times it seems to work in a counter intuitive way, and when things don't look right, it's the very devil to find out what needs adjusting. Maybe I just need to spend more time on it. I've used it for a couple of short animations where Strata didn't have the right tools, but I'm not brave enough to make the switch just yet! But... the real-world physics stuff for animations is quite incredible - once you can get it to work properly! Where would we be without Photoshop? Another piece of software I've been using since the year dot, and utterly indespensible. Ditto After Effects and Premier Pro. These three all work together, and After Effects will even import C4D scenes to allow for post processing, which is just mad! Couple that with something like Video Copilot plug-ins, and you can produce true Hollywood style effects. On the face of it, it's an extraordinary piece of software. Create realistic landscapes, skies and scenes with a few clicks, adjust the senery and atmosphere, render, animate... and it integrates with C4D so you can have the Vue environment within the scene. However, it has to be the most unstable piece of software out there - it'll crash if you so much as look at it funny, and the rendering is glacially slow if you want anything other than preview quality. Having said that, the results can be spectacular - all the backgrounds for the 'Vulcan's Hammer' pictures were done with Vue 9, and it'll produce full 360˚ renders which can be used in other programmes, such as Strata. Fantastic for scenes which would be difficult or impossible to get decent photos of. 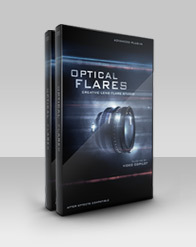 Slick, easy to use, fabulous results... it's almost too easy to load up every scene with a ton of effects, just because you can. Their Optical Flares are just beautiful! And it's not just for motion graphics either - it's not widely know, but you can use After Effects to produce Photoshop files, which means you can use all the effects which AE has, but PS does not. They also have a wide range of stock footage and sounds, and the tutorials are brilliant.